A few weeks ago, I published Milton’s Century: A Timeline of the Literary, Political, Religious, and Social Context of John Milton’s Life. Its purpose was to establish a context—a matrix—for the development of a great poet’s thinking by identifying events that occurred around him, everyday events that directly or indirectly might have influenced him. To do so, I constructed a chronology of the century over 650 pages, year by year, sometimes day by day, in an attempt to suggest the milieu that produced Paradise Lost, Paradise Regained, Samson Agonistes, and scores of other masterworks. 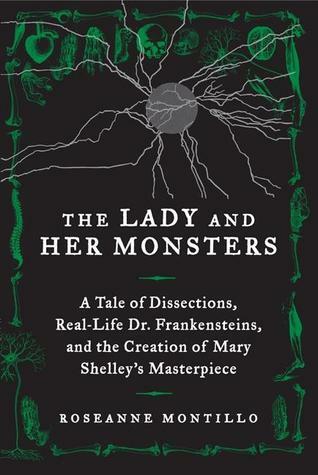 Roseanne Montillo’s The Lady and Her Monsters: A Tale of Dissections, Real-Life Dr. Frankensteins, and the Creation of Mary Shelley’s Masterpiece attempts something similar by approaching its subject—Shelley’s Frankenstein—with a much wider-angled lens. Her study begins in 1786 by recounting an early experiment in Galvanism, the application of electric current to stimulate movement in the tissues of dead frogs…a precursor to the common image of the Frankenstein monster being re-animated through the power of lightning. The book moves back and forth in time and place to touch upon Renaissance alchemists; eighteenth- and nineteenth-century grave robbers (“Resurrection men”); Mary Shelley’s husband, parents, siblings, and children; and a little bit of everything and everyone else related to the history of dissection and the philosophy of reanimation. It is at times a bit helter-skelter in the transitions from one topic to another, but at its core is the image of Mary Shelley and her creation, with Montillo suggesting avenue after avenue by which Shelley might have, could have, probably, most certainly did glean this idea or that. And as such, it provides a useful index to the complexities that resulted in a milestone novel, the first Science Fiction novel according to Brian W. Aldiss, and one of the touchstone works of the Modern Age. The book is illustrated by dozens of woodcuts and engravings from earlier centuries, including reproductions of portraits of Mary Shelley and Percy Bysshe Shelley, all of which give it a certain visual interest, reminding readers of how stimulating many of the experiments, personalities, and peripheral undertakings were to their original audiences. My major concern with the book, however, is its tone. At times, it struggles for academic respectability; at other times—as with the frequent meteorological references…”It was a hot day when…”—it seems more interested in popularization, often dropping to colloquial levels. Throughout, points are supported with quotations…but the quotations lack any of the apparatus that would allow intrigued readers to follow through with additional investigation. There are no in-text references, no foot-notes leading to further information. There are “Notes” at the end of the study, but they are uniquely unhelpful in identifying sources for comparison or additional reading. There are no identifying numbers or page references to tell where the quotations or data occur in the text; and sources are cited by author and title only—no publication information, no pagination. This seriously cripples the book as far as stimulating further research. Bits and pieces of the necessary information are included in the “Bibliography,” which basically means that in order to follow a train of thought, readers must check all three parts of the book—the text, the “Notes,” and then the “Bibliography”—an unnecessarily onerous chore. I wanted the book to succeed. The subject itself is fascination, considering Shelley’s age when she wrote Frankenstein. And the historical period is certainly intriguing, wavering as it did between the ancients and the moderns. But ultimately The Lady and Her Monsters left me with the feeling that there was much more to be said, that the story might have been more compactly organized, that it might have given readers more help in following various strands.